Home > Advice > Apprenticeships > Degree apprenticeships: What are they and are they for me? Degree apprenticeships allow you to combine practical, workplace training with a university degree. Apprenticeships with degrees! Sounds like the best of both worlds, right? In this guide, we answer all your questions so you can decide whether this new qualification could be for you. Simply put, they're apprenticeships with degrees! They were introduced by the government in 2015 to offer young people a practical route into work as well as some academic background on their subject. They are one of the four main types of apprenticeship. Degree apprenticeships are set up by the employer, who works with a university to come up with a degree course which provides all the theoretical background behind the job. You'll graduate with a bachelor's degree (like a BEng in engineering) or a master's degree (like an MEng). This makes it a level 6 apprenticeship for those who complete a bachelor's, and a level 7 qualification for those who do a master's. Once enrolled, your time is split between university and work. You'll be paid a wage by your employer throughout the course, which will last at least three years, but could go on longer. Are they available in Wales, Scotland and Northern Ireland? Degree apprenticeship are available in England and Wales. The UK degree apprenticeship is not currently available in Scotland, although you can still apply for one in England and Wales. Scotland has a similar scheme called the "graduate-level apprenticeship". In 2018, there will be 11 courses available at 12 Scottish universities and colleges,, focusing on areas such as construction, engineering, management, cyber security and IT. Visit Apprenticeships.scot for more info. The scheme isn't available in Northern Ireland, but you can still apply for a degree apprenticeship in England or Wales. Higher apprenticeships are also available in Northern Ireland, and many of these lead to degrees. Check out the NI Direct website to learn more. How is it different to a higher apprenticeship? You may have heard of higher apprenticeships, which often include a university degree as well. The difference is that all degree apprenticeships include at least a bachelor's degree as part of the course. Higher apprentices are guaranteed the equivalent of a foundation degree, and some of them go on to complete bachelor's or master's degrees - but this isn't built into the course. Why should I do a degree apprenticeship? Degree apprenticeships are ideal if you know what line of work you want to go into, but also want to study the theory behind what you do from a more academic point-of-view. This way, you'll get the best of both worlds, gaining a deep understanding of your subject as well as the ability to apply it in the workplace. Even if you choose to leave the employer you completed your apprenticeship with, you'll be highly employable when you graduate. You'll have a degree, several years of practical experience, workplace skills (sometimes called "soft skills" but nothing to do with kittens), and often practical, work-based qualifications like NVQs (usually called "vocational qualifications") as well. Why shouldn't I do a degree apprenticeship? Degree apprenticeships aren't for everyone. At the moment, the subjects available tend to be quite technical (see below), with one or two exceptions. If you have your heart set on an arts or humanities degree, a degree apprenticeship probably isn't for you. If you're in sixth form and your A-levels are mainly in the arts and humanities, it might be worth talking to a teacher, careers adviser, or head of sixth form if you're interested in studying for a degree apprenticeship. As you can see from this list, most of the courses are quite technical. However, PR does offer an option if you want to go into the communications industry, and management if you want to work on the more strategic side of a company. The list is growing all the time – so watch this space! What employers offer degree apprenticeships? Nothing! Like other types of apprenticeship, your employer will pay you a wage. Pay can vary a lot, but you are guaranteed the minimum apprenticeship wage, which is currently £3.70 an hour. This will go up when you reach the age of 19 and finish your first year. At this point, it will increase to the National Minimum Wage, which will be £5.90 or more, depending on your age. These figures are correct as of April 2018. Minimum pay rates are generally updated in April. How are degree apprenticeships paid for then? They're paid for by the employer and the government. The employer pays one third of the cost, and the government pays the remaining two thirds, up to a total of £18,000. The government also pays some money towards any training and assessment that comes from outside the employer or the university. It very much depends on the employer, but you can expect to spend a lot of time at university and a lot of time in the workplace! Let's take Jaguar Land Rover's course in engineering. During the first year, most of term time will be spent learning the fundamental of engineering at university, with vacations spent at a Jaguar Land Rover factory. In second year, you'll up your hours at the plant, and drop your time spent at university. Later on, you'll go on to complete your engineering degree at a prestigious university. Because your course is practical and workplace-orientated as well as academic, you'll often complete other qualifications such as NVQs on top of your degree. What do parents think of them? As we mentioned above, they are mostly available in technical subjects at the moment, so you need to think about whether this fits in with your plans for your education and career. Courses are only available in England at the moment, but you can still apply for a degree apprenticeship in England if you come from Scotland, Wales or Northern Ireland. Once you've found a course you're interested in, you need to check whether the employer has any of their own requirements on top of the basic ones, and find out whether you meet them. You generally apply through the employer rather than the university. There are several places where you can search for a degree apprenticeship, including the government's website and UCAS. Some universities advertise them as well. 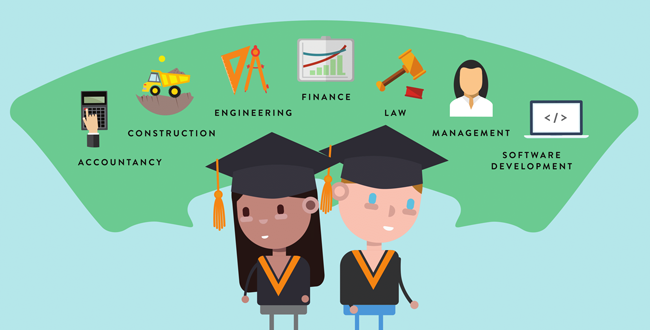 If you like the idea of a degree apprenticeship but think that a traditional university degree might be for you, why not look at the differences?